"There is evil in this world, hatred and revenge." Robert Stromberg (a production designer on Alice in Wonderland and Avatar) is making his directorial debut with Maleficent. The script is written by Linda Woolverton (The Lion King, Beauty and the Beast). 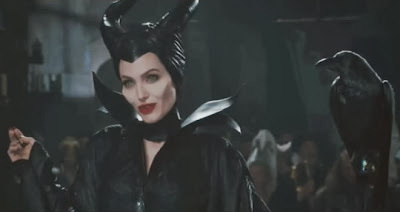 Angelina Jolie plays the iconic villain from the classic Disney film Sleeping Beauty in this live-action spin that also stars Sharlto Copley (District 9), Elle Fanning as Sleeping Beauty - kind of miscast in my opinion - (Super 8), Sam Riley (On the Road), Imelda Staunton (Harry Potter and the Order of the Phoenix), Juno Temple (Atonement) and more. Disney sends Maleficent to theaters everywhere in 3D on May 30th, 2014. Visit the film's official website. I think the movie looks absolutely terrible. Red Box???? OMG! You know I can't wait for this movie!! Sleeping Beauty is my all time favorite Disney movie so I'm sure that's part of it. It looks really good to me... Especially from what I've read about the plot. So excited!! !